The Virginia Beach-Norfolk-Newport News MSA, also known as the Hampton Roads MSA, is located on the eastern coast of Virginia, and is the largest metropolitan area in the State. 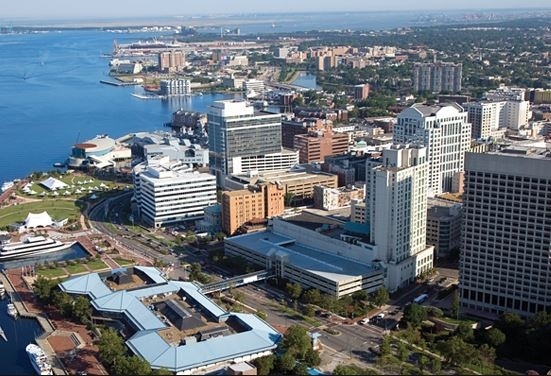 Hampton Roads, the body of water from which the area gets its nickname, borders the Hampton Roads metro area, and is one of the world's largest natural harbors. The Virginia Beach-Norfolk-Newport News area is one of the oldest settled regions in the United States. Virginia Beach and Norfolk are the two most populated cities in the state of Virginia. The largest navy base in the world, Naval Station Norfolk, is located in Norfolk, along with one of NATO's two strategic command headquarters. The population of the greater Virginia Beach Norfolk area has been steadily growing over the past two decades, however the immigrant population in the area is currently growing twice as fast as the native population. Approximately one half of all foreign-born people in the greater Virginia Beach-Norfolk area are from Asia. Over seven thousand Asian Indians live in the Virginia Beach-Norfolk area, and sixty-one percent of them were born outside of the United States. There are over twenty thousand Filipinos living in the greater Virginia Beach-Norfolk area, and more than 20% of all immigrants in the area are Filipino. The Hampton Roads metro area has seen a significant increase in immigration over the last decade. The immigrant population has almost doubled since the beginning of the 21st century. One of the primary reasons for such a significant jump in the foreign-born population is the influx of Asian immigrants. Immigrants from all over east, southeast, and south Asia have arrived in great numbers over the past fifteen years. The area has especially concentrated Asian Indian, and Filipino populations. The area has also recently gained a large number of Hispanic immigrants as well, with over a quarter of the city's foreign-born population coming from Latino countries. The Hispanic population is the second fastest growing immigrant population in the area. With the immigrant population increasing at almost twice the rate of the natural population, the Virginia Beach-Norfolk-Newport News metro area becomes more diverse by the day. Displaying 1-25 of 38 results. Asian Indians in Hampton Roads- A good article detailing the life of Asian Indians living in the Hampton Roads area.